Jane Blundell Artist: Ultramarine, Mid yellow and Magenta - a gorgeous basic bright triad with Ultramarine. Ultramarine, Mid yellow and Magenta - a gorgeous basic bright triad with Ultramarine. I wrote a post about this set here in May 2013. I wanted to have another look at them, so here is the amazing range you can get with Ultramarine Finest Schmincke PB29, Purple Magenta PR122 Schmincke and Hansa Yellow Medium PY97 Daniel Smith, though Schmincke Pure Yellow would do the same thing. Or if using W&N, Winsor Yellow, the more granulating French Ultramarine and Quinacridone Magenta. If you want to add a 4th to create neutral browns and greys more quickly, add an orange - a bright orange as seen here or a Burnt Sienna as seen here. This is an alternative to the beautiful bright quartet using Phthalo Blue Red Shade shown here. Alternative primary red options are the more crimson W&N Permanent Alizarin, DS Carmine or DV Permanent Alizarin Quinacridone. I prefer the more crimson primary reds, since I don't see a lot of 'magenta' out in the real world - more pinks and crimsons, but nothing I have used mixes cleaner than PR122. Another excellent primary red is a PV19 Quinacridone Rose (or Permanent Rose). It will also mix clean purples and oranges. It is slightly less powerful than the magenta, but more lightfast and is a basic colour in my palette. Hi. 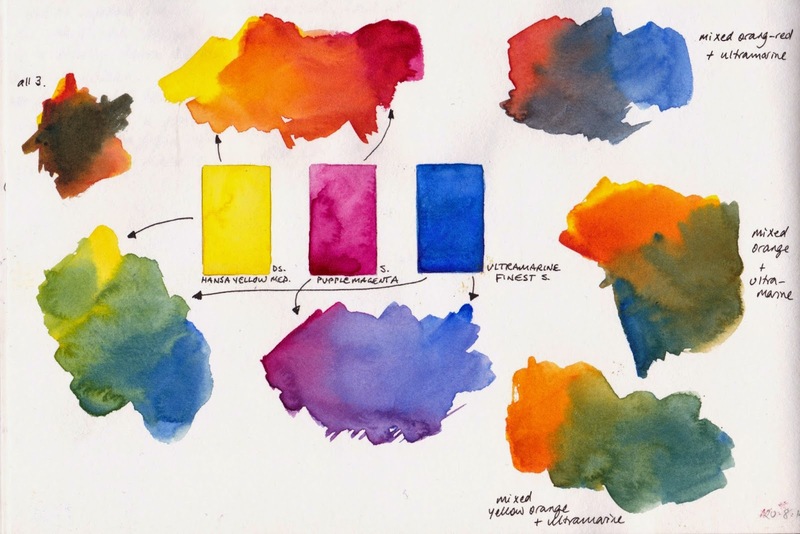 I am a newcomer to watercolours and have a schmincke travel set, so I've been quite interested in your discussions that cover Schmincke alternatives to your favourite Daniel Smith etc. Especially since I can't get Daniel Smith & Da Vinci except by mail order. From your articles elsewhere, if I'm wanting to stick with Schmincke, then the 4th colour for me seems to be their Transparent Orange, as their Burnt Sienna is a mix of PR 101 and PBk 9. But, what are the actual disadvantages you see in using a mixed colour like the Schmincke Burnt Sienna? If I went the Transparent Orange for the 4th colour, would it also be useful to get one of the Umbers (raw or burnt) that Schmincke make as a 5th to give me some quick access to the earth colours, or would you suggest something else? That is a very good question Alistair. Transparent Orange is a gorgeous orange and will mix a lovely range of burnt sienna, burnt umber, indigo and grey hues with Ultramarine, as well as lovely reds with Purple Magenta. The earth pigments give you a more 'earthy' look and are especially good for landscape work. PR101 used as a burnt sienna hue is usually a transparent burnt orange so wouldn't make many different mixes from the Orange. The Schmincke version also has a black which may dull your work. PBr7 is found in Schmincke Burnt Umber, so that would increase your pigment and mixing options. So I would suggest you add the Transparent Orange to keep a bright set and also the Burnt Umber for the earthy options. If you want another bright colour you could add Helio Green (phthalo green yellow shade in other brands) as it neutralises with magenta. The 6th bright would be purple but that is so easy to mix I wouldn't bother. Note - you may prefer Phthalo green. Either way, mix it with other pigments as they are both too bright to be used alone for lifelike greens. For a yellow earth hue add a touch of Burnt Umber to the Pure Yellow. Thanks for that. I think I have all but the Transparent Orange in Schmincke pans, so I see if I can get that. Then I'll be good to go with the mix you've suggested. I also have an 'umber' somewhere, just can't remember if it is raw or burnt. Either way I can experiment. Thanks again for clarifying things. Hi. This looks like a gorgeous combination. I only have access to Rembrandt colours and they don't have a Y97 yellow. Will Y35 Cadmium yellow medium work best as a replacement? I don't have enough money for a full set, so I'm settling down for a limited palette. something like these 3 and raw&burnt sienna and payne's grey.